Looking at the photo above, you see a small boat on the right. The three people to the left look even smaller. The landscape dominates. The rocks have seen it all. We humans are so full of ourselves. It is not a bad thing to feel small every once in a while. 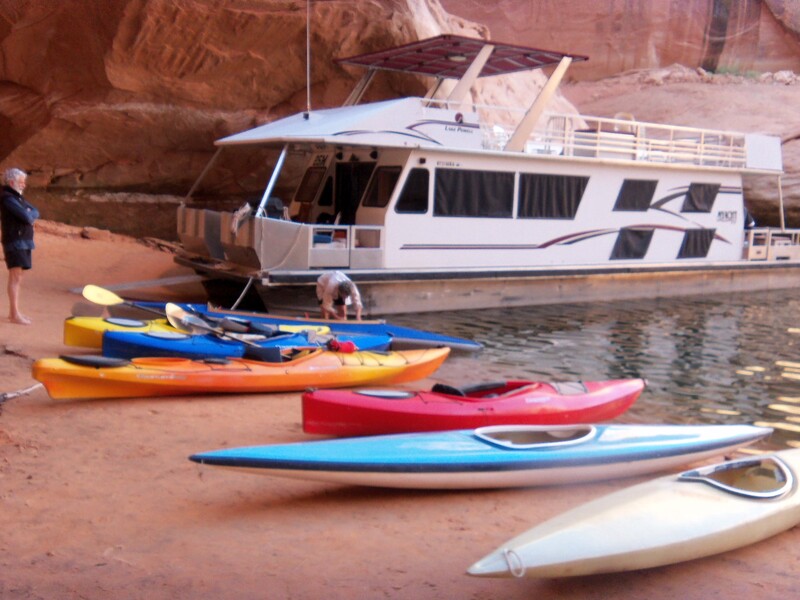 Spending a week houseboating and kayaking on Lake Powell is a good grounding – if indeed you can be grounded on water. The pace is slow. It is just you and the rocks and the water and the night sky. This winding down… this floating with no agenda takes a bit of doing. Once aboard a houseboat, you are captive. Your phone, computer and iPad do not receive. Reception is spotty. You can’t shop; you can’t go to work; you can’t phone a friend; you can’t keep your fingers on the political pulse of the nation. Like an astronaut you feel weightless… you float above the fray. You look down from a distance… tethered to life support – in the astronaut’s case tethered to the International Space Station / in your case, tethered to the houseboat. As we look for a bit of sand in which to anchor the houseboat, we cruise slowly at a half a mile per hour. I close my eyes. I am in a baby’s cradle being rocked by a nursemaid on the verge of sleep herself. in relation to the rocks. Off in space, you break the bonds that tie you to life on Earth. Basking in the bubble bath of time, you slow to a crawl. Denied the opportunity to run, you spend more time looking and reflecting.The immensity of the rock formations makes you small. You are diminished in size and power. Age-wise, you are just a speck. 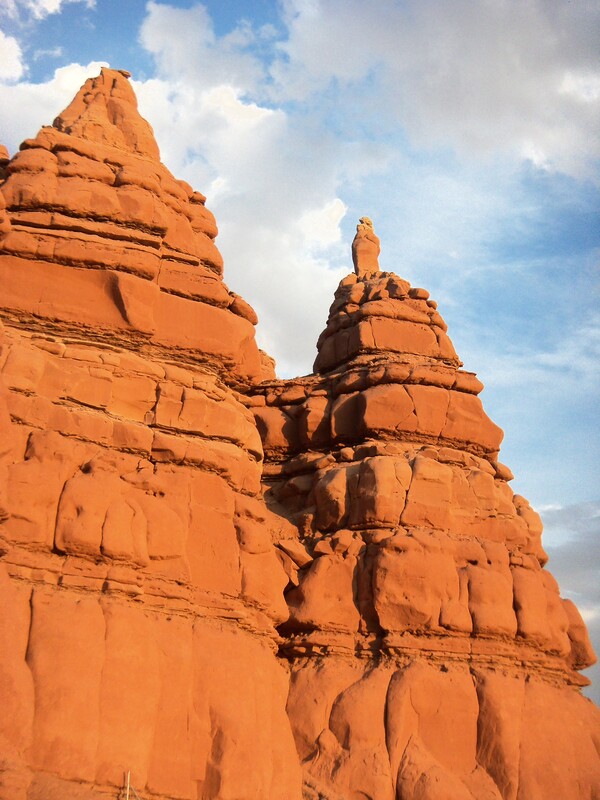 The sandstone rocks and cliffs tower above you. Craning your neck, you are filled with wonder. Pen in hand, I find myself half remembering How To Be a Poet, a poem by Wendell Berry. I go to http://www.poetryfoundation.org – the source of all half-remembered poems. Berry begins: Make a place to sit down / Sit down. Be quiet. Berry continues in the second stanza: Breathe with unconditional breath / the unconditioned air. / Shun electric wire. / Communicate slowly. Love / a three-dimensional life; ‘ stay away from screens. / Stay away from anything / that obscures the place it is in. / There are no unsacred places / there are only sacred places / and desecrated places. 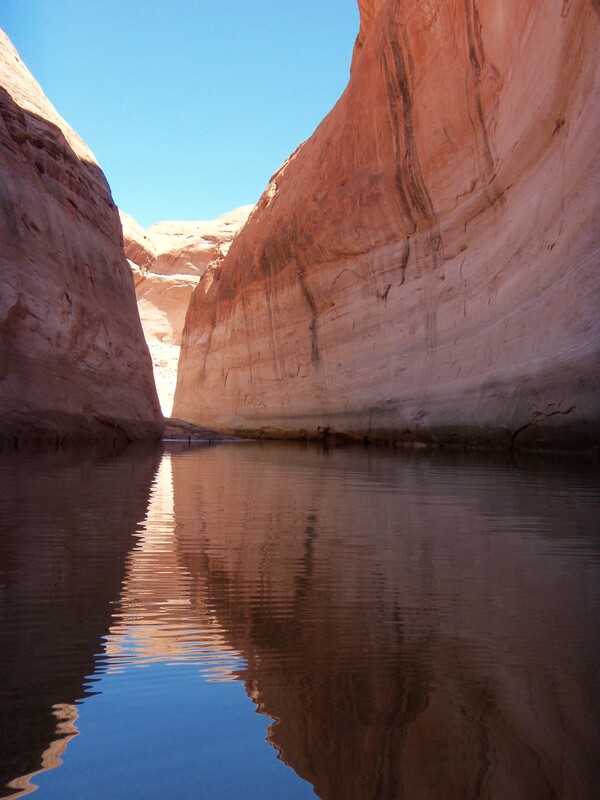 It is easy to sense the sacred in Glen Canyon on the Colorado River. It is the pace that makes that possible. 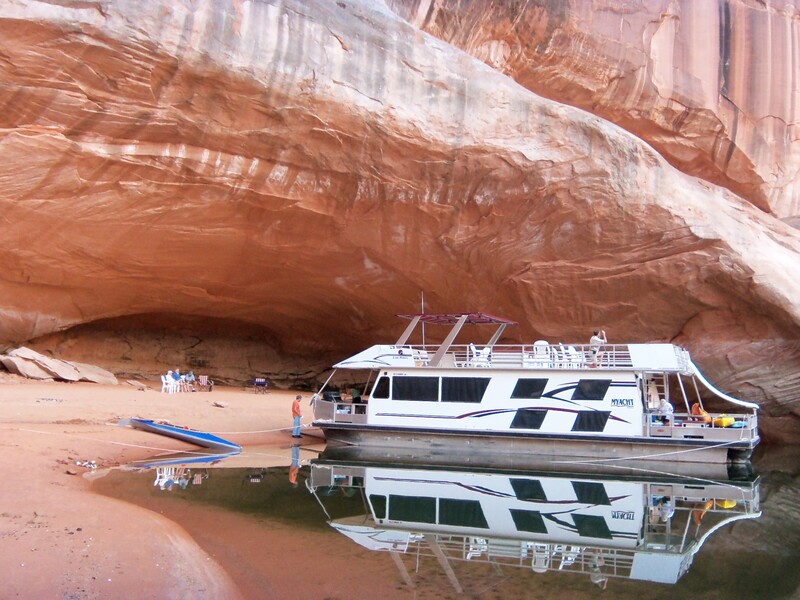 Lake Powell, a reservoir created by the construction of Glen Canyon Dam in 1972, is 200 miles in length and according to the National Park Service, has 1,960 miles of shoreline. 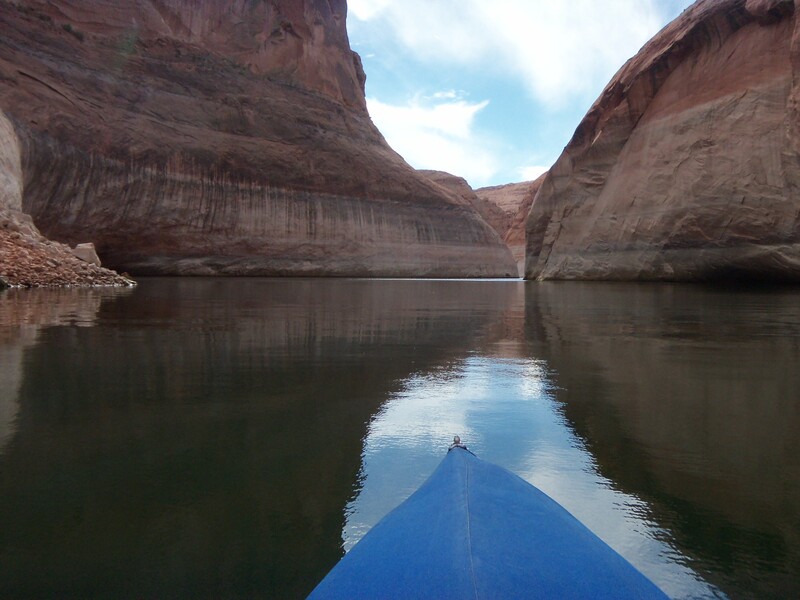 Some 96 major canyons 15 to 20 miles in length run like arthritic fingers off the river. We boarded our boat at Bullfrog Marina. Our destination was Escalante Canyon – reputedly the canyon that gives viewers the best idea of how the landscape might have appeared before the flooding. I wonder if the explorer, geologist, cartographer John Wesley Powell (the first to lead an expedition down the Colorado River in 1869) took in the romance. Surely his response was not just scientific. I came home with a list of questions. I’m curious about the Mormons. What route did they follow as they crossed Utah? 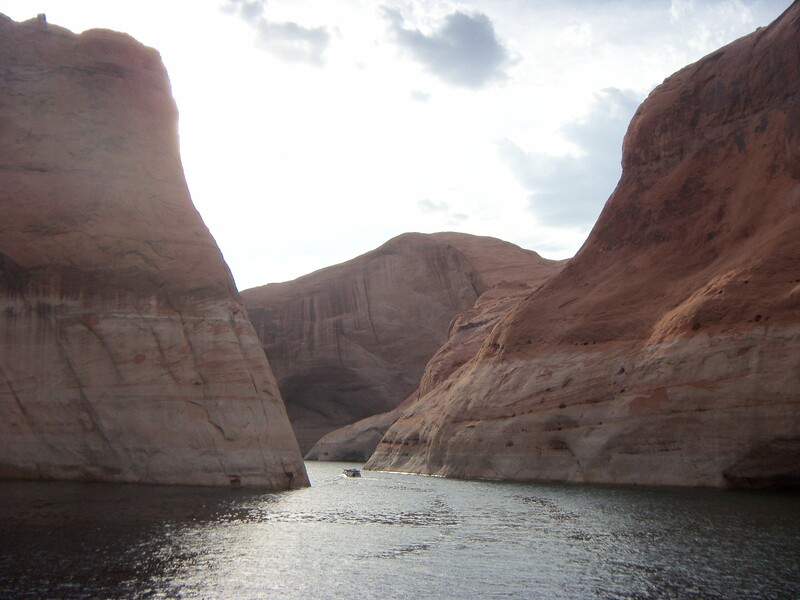 What controversies surrounded the building of the Glen Canyon Dam? What issues are on the table today? The water appears to have fallen dramatically… is this seasonal or the effects of a long drought? What is the forecast? What have been the ecological consequences of damming the river? Who benefits from the power and the water supplied by the dam? I don’t have all the answers today, but I’ll get on it. The water comes in all colors: blue, green, silver, pin-hammered slate gray, milky tea and mudpuppy brown. Unless the sun creates a reflection, and then the rocks towering above the water layer on transparencies in shades of red, pink, ochre and ivory. Below the surface of the water we see sand snaking in parallel paths. Another boat draws near and we hear the high-pitched shrieks of children pleading, ‘Please, Grandma, stop here! We want to swim. We want to swim!” Two of our party did swim and snorkel. As for me, the October water is not quite warm enough. I feel my age: the children’s voices and enthusiasm remind me of when I was younger and the water was never too cold. The children delight in the mud close to shore. The rules “Get out of the mud this instant!” fall by the wayside. Grandma holds her tongue. The children slather on the mud. They treat their arms and legs. Still no sharp voice of disapproval And finally, with the finesse of a woman before her vanity mirror, they apply make-up mud to their faces. I have a vicarious thrill. The mud is cool and then as it dries, it is tight. I sit and watch – not tempted to join in, but remembering when I would have. Molded by parents, education, and societal expectations we adults have lost a great deal. The kayaks are for exploring. Quiet now. We listen for Canyon wrens. We watch the ravens ride the thermals. We watch the catfish cruising – their heads humped up skimming the surface of the water… their mouths open. A lone duckling – more fluff than feathers, too innocent for its own good, seems oblivious as we paddle closer and closer yet. We chat with six serious kayakers from Michigan. Their kayaks are weighed down with bedrolls, sleeping mats, food, tarps and tents. Hearty folk – not from Detroit… probably from Ann Arbor or the Upper Peninsula. I do not want a kayak large enough for camping gear. Water, a bottle of wine, some crackers and cheese will do me. And a book. One of the three books that I read aboard (love that quiet time) was Margaret Atwood‘s The Blind Assassin. I wonder if I had a tandem kayak and I promised to do all the paddling, would Margaret Atwood spend a week with me? Probably not. I nose my kayak forward. I follow the light. 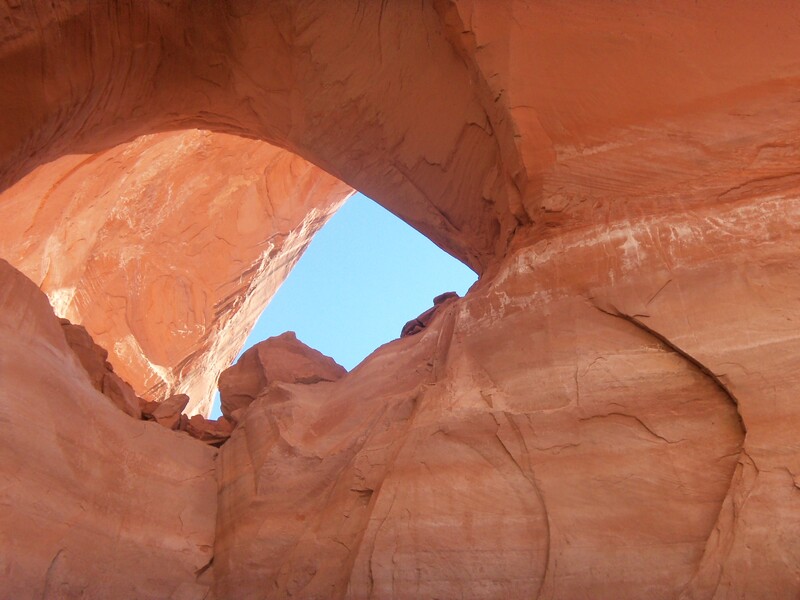 This entry was posted in Uncategorized and tagged Bullfrog Marina, Escalante Canyon, Glen Canyon Dam, How To Be a Poet, John Wesley Powell, Lake Powell, Margaret Atwood, The Blind Assassin, Wendell Berry. Bookmark the permalink.